Authentic and Original MS Windows XP Pro Folder. Authentic and Original MS Windows XP Pro Hologram CD. Authentic and Original UNUSED Windows XP Pro Product Key. MS Part/SKU: E85-02667. The MS Product Code is E85-02667. Like new condition. I haven't built my own computer in years so I don't need it anymore. Was previously installed on a machine I built, but removed and decommissioned that machine several years ago. Trending at C $241.29eBay determines this price through a machine-learned model of the product's sale prices within the last 90 days. 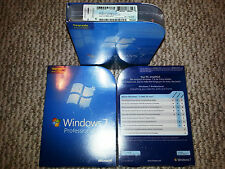 Microsoft Windows XP Professional with SP2,SKU E85-02666,Sealed Retail Box,Full. Condition is Brand New. Shipped with Standard Shipping. The Microsoft SKU is E85-02665. Internet Explorer 6 includes many new and enhanced features that simplify tasks, increase reliability, and help maintain the privacy of personal information on the Web. Still in clamshell never opened. Windows XP will also allow the user toconnect back to the desktop from any location, and support for new wirelessnetworks will be built in. Windows XP will make it easier for households to share a single PC and share pictures, music, files,printers, and other resources. With Windows 7 Professional, fewer walls stand between you and your success. Need to use multiple languages on your PC or help protect your data with enhanced BitLocker security?. Get Windows 7 Ultimate. New ,sealed,sticker is partially open .Check pictures and ask questions before buying.Sold As-Is.No returns. Microsoft Windows 7 Professional Upgrade 32 & 64 Bit With Product Key Code. Condition is Like New. Shipped with USPS Media Mail. Please pay upon winning auction. All sales final. Thanks! With cheap Windows 7 software, fewer walls stand between you and your success. The Microsoft SKU is FQC-00130. Run many Windows XP productivity programs in Windows XP Mode. Computer and processor. 1 GHz or faster 32-bit (x86) or 64-bit (x64) processor. Original MS Windows 8 Professional Hologram DVDs(includes both 32 and 64 bit DVDs). This version of Windows 8 is designed as an upgrade for Windows 7. If you are upgrading from Windows Vista or Windows XP, you will need to back up your files and settings, perform a clean install and then re-install your existing files, settings, and programs. MICROSOFT WINDOWS XP PRO w/SP1 FULL OPERATING SYSTEM MS WIN XP PRO =LIGHTLY USED=. Condition is Like New. Shipped with USPS Media Mail. As on my knowledge, it's never been installed, but because the box is opened, I can't prove it. Includes install CD, all manuals and product key code. 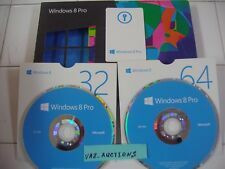 MICROSOFT WINDOWS 8 PRO - FULL/ UPGRADE VERSION 64/32 Bits, 2 DVD Installation. In addition, the product is distributed through DVD. Model Microsoft Windows 8 Pro. Family line Microsoft Windows. Platform Windows. We are committed to resolve all issues in a friendly and satisfactory manner. 4.5 out of 5 stars - MICROSOFT WINDOWS 8 PRO - FULL/ UPGRADE VERSION 64/32 Bits, 2 DVD Installation. 60 product ratings60 product ratings - MICROSOFT WINDOWS 8 PRO - FULL/ UPGRADE VERSION 64/32 Bits, 2 DVD Installation. Microsoft Windows XP Professional Upgrade v. 2002 Retail Includes Service Pack 2. Condition is Good. Shipped with USPS Media Mail. Virtual PC lets you enjoy the best of both the Mac and PC worlds. It enables your Mac to run Microsoft Windows system-based software, access Windows networks and share files easily with PC users. And you can do all this without having to leave your Mac desktop - so you can work the way you want to work. It provides better protection against viruses, hackers, and worms, and includes Windows Firewall, Pop-up Blocker for Internet Explorer, and the new Windows Security Center. You don't have to format your hard drive, and loose you applications and data. Microsoft Office XP Professional Version 2002- Upgrade. This suite contains the following Microsoft Office Programs Excel 2002. PowerPoint 2002. Outlook 2002. Access 2002. PROGRAM CD. Note If you do not have any Office Product installed on your system we will include a set of Office 2003 OEM CD's FREE! Microsoft Windows XP Professional (Retail (License Media)) (1 User/s) Upgrade opened box. Includes service pack 2. Condition is Very Good. Shipped with USPS Media Mail. Windows XP Professional Upgrade Disc. Trending at C $33.51eBay determines this price through a machine-learned model of the product's sale prices within the last 90 days. • Reinstall a fresh copy of Windows XP Professional. Windows XP. You must use your own Windows XP Professional product key. At least 1.5 gigabytes (GB) of available space on the hard disk. Professional SP2 (64-Bit). • Reinstall a fresh copy of Windows XP Professional. Windows XP. You must use your own Windows XP Professional product key. At least 1.5 gigabytes (GB) of available space on the hard disk. • Slow Computer ProblemsThis is a must have if. • Reinstall a fresh copy of Windows XP Professional. Windows XP. You must use your own Windows XP Professional product key. At least 1.5 gigabytes (GB) of available space on the hard disk. Professional SP3 (32-Bit). Lot of 5 sealed disks as pictured. Trending at C $79.11eBay determines this price through a machine-learned model of the product's sale prices within the last 90 days.